"Taken 3 (sometimes stylized as Tak3n) is a 2014 English-language French action thriller film directed by Olivier Megaton and written by Luc Besson and Robert Mark Kamen. 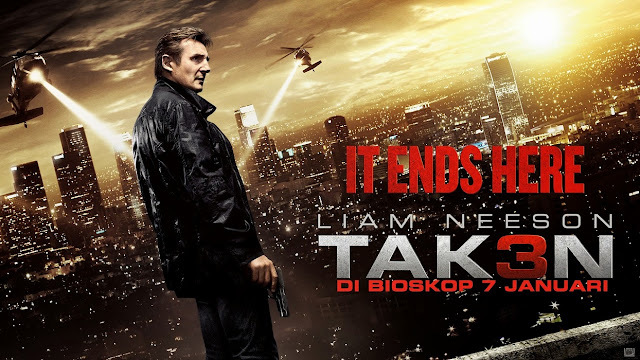 It is the third and final installment in the Taken trilogy. The film stars Liam Neeson, Forest Whitaker, Maggie Grace, and Famke Janssen. Principal photography began on March 29, 2014 in Los Angeles. In North America, 20th Century Fox released the film on January 9, 2015. The film was released in France on 21 January 2015." "Former covert operative Bryan Mills (Liam Neeson) visits his daughter, Kim (Maggie Grace), to deliver a birthday gift. After an awkward visit, he invites his ex-wife, Lenore (Famke Janssen), to dinner. Although she declines, she shows up at his apartment and tells him about her marital problems. He agrees to let her try to work things out with Stuart (Dougray Scott). The following day, Bryan receives a text from Lenore asking to meet him for breakfast. Bryan goes out for bagels; and, when he returns to his apartment, he discovers her lifeless body. L.A.P.D. units immediately appear and try to arrest him; but he resists and escapes. Meanwhile, L.A.P.D. Inspector Frank Dotzler (Forest Whittaker) familiarizes himself with Bryan's background and issues a B.O.L.O. for him. Bryan retreats to a safe house equipped with weapons and surveillance electronics. He retraces Lenore's travels to a remote gas station convenience store and finds surveillance footage of her being abducted by unidentified men with unique hand tattoos; but L.A.P.D. detectives arrive and arrest him. While in-transit, Bryan frees himself, hijacks the police cruiser, escapes, and downloads phone records from an L.A.P.D. database onto a thumb drive. He contacts Kim at Lenore's funeral via his former covert co-workers and friends instructing her to maintain her ""very predictable schedule"". She purchases her daily yogurt drink which is marked ""Drink Me Now"". She ends up feeling nauseated and runs to the restroom where Bryan is waiting and surprises her. (He had put a drug in the drink, and now gives her the antidote.) Bryan removes a surveillance bug that, unknown to her, was planted by Dotzler. He tells her that he is looking for the real murderer and that she should keep safe. She tells her father of her pregnancy and that Stuart is acting scared and has hired bodyguards which he has never done before. Bryan tails Stuart's car but is ambushed and pursued by another SUV, and his car is pushed over the edge of a cliff. He survives the crash, hijacks a car, follows the attackers to a roadside liquor store and kills them. Bryan then abducts and interrogates Stuart, who confesses that his failure to repay a debt to a former business partner and ex-Spetsnaz operative named Oleg Malankov (Sam Spruell) was the reason Lenore was killed and that he exposed Bryan's identity to Malankov out of jealousy. With assistance from his old colleagues and a nervous Stuart, Bryan gains entry to Malankov's heavily secured penthouse. After killing the guards, a furious gun battle, and brutal fight, a mortally wounded Malankov reveals that Stuart tricked them both. Stuart planned Lenore's murder and framed Bryan as part of a business deal to collect on a $12M insurance policy. When Malankov failed to kill Bryan, Stuart used Bryan to kill Malankov and remove all threats. Meanwhile, Stuart shoots Bryan's ally, Sam (Leland Orser), and abducts Kim, intending to flee with the money. Under police pursuit, Bryan arrives at the airport in Malankov's Porsche as Stuart's plane is taxiing toward takeoff. After destroying the landing gear, preventing the plane from taking off, Bryan overpowers Stuart and prepares to kill him but pauses at Kim's pleas. He tells Stuart to expect final punishment if he escapes justice or completes a reduced prison sentence. Dotzler and the LAPD arrive to arrest Stuart. Bryan is cleared of all charges. In the aftermath of Stuart's arrest, Kim who is pregnant, informs Bryan that she wants to name her baby Lenore after her mother."